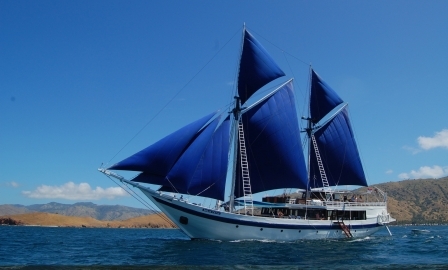 November 21, 2012 we joined the Ombak Putih run by SeaTrekBali in Ambon harbour, a traditional Indonesian sailing vessel except for the ensuite bathrooms and air conditioned cabins! We were a group of 23 interested and interesting people all with some connection to Indonesia, some from Holland, America, Malaysia and the rest of us from Australia. 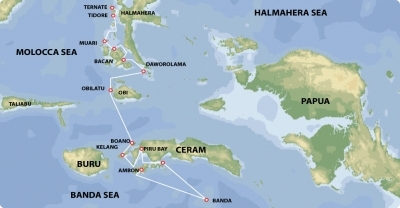 After a day looking around Ambon we departed the following evening for the fabled Banda Islands, the only place in the world where nutmegs originally grew. The nutmegs were both a blessing and a curse, as the forts built on the islands tell the story of the battles that were fought between the Bandanese and the Dutch East Indies Company, and then the Dutch East Indies Company (VOC) and the English East Indies Company (EIC), over these seeds that once they were brought back to Europe were said to be worth their weight in gold. We spent an afternoon exploring the town of Banda Niera, and taking a stroll through history. Old colonial buildings line the narrow streets of the town, we visited the museums, the mini-Palace which was the residence of the Dutch Governor and the VOC administrative headquarters, and the Nutmeg Cafe. We finished the day on the walls of the restored Fort Belgica which overlooks the town, built by the Dutch in 1611 its pentagon shape, its inner and outer defensive walls and its ancient cannon still pointing out to sea, tell of its importance for the defence of the islands. The following day we visited the nutmeg plantations on Lontor or Banda Besar. Here, the Dutch divided the island into perks or allotments where the Dutch planters or perkeniers could cultivate their nutmeg trees on behalf of the VOC. Some of us ‘spice nuts’ were in nutmeg heaven as we wandered through the fragrant groves of nutmeg trees, shaded by the bigger Kenari (candlenut) trees.